Ten quick hits to recap a busy weekend aboard two decommissioned aircraft carriers and a damp gator. 1. 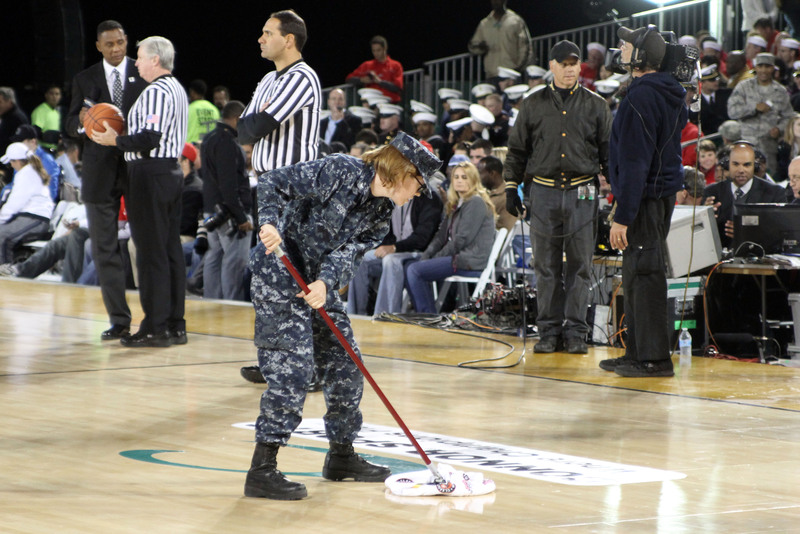 The games that finished: To minimal fanfare and with a relatively dry court, Notre Dame’s women’s team defeated the Ohio State women 57-51 on the decommissioned aircraft carrier Yorktown in Charleston, S.C., on Friday afternoon to begin what was supposed to be a four-game weekend shipboard slate. On Sunday in San Diego, the Syracuse men easily dispatched San Diego State 62-49 aboard the decommissioned carrier Yorktown. Between those games, things got interesting. 2. The first washout: The Ohio State and Marquette men never got started Friday night on Yorktown, as on-court condensation created dangerous playing conditions. 4. Not just dew: Playing on Midway wasn’t as damp, but shooting wasn’t easy for the Aztecs or the Orange. It was the rare basketball game where the team facing one basket (namely, the enclosed end of the court) had a clear edge over the team facing the other. There were also court and scoreboard issues. 5. Good time had by all: Despite the problems, it was hard to find a coach, player or event official with a bad word to say about the events as a whole. Jacksonville and University of Florida officials were enthralled by the proceedings, to the point the mayor pledged to play again next year. Ohio State coach Thad Motta put it simply: “Yeah, we didn’t get to play. But the purpose was served.” Mike Whalen, who promoted last year’s inaugural Carrier Classic and this year’s Yorktown event, said he already had teams eager to play onboard Yorktown next year, but might consider a simple rematch. 6. The best shots: Check out USA Today’s slide show of the Yorktown event here. 7. The pot shots: Reports that didn’t come from the parties involved in the games were less than glowing. One writer suggested future shipboard schools bring extra mops and buckets. An AOL FanHouse columnist lamented the “Banana Peel Classic.” A CBSSports.com blogger called the games an “embarrassment” and suggested the outdoor season-openers had outlived their usefulness. 8. Next year? : Get ready for a four-ship festival. 9. Non-flattop military update, Part I: A big win for new Connecticut head coach Kevin Ollie as the Huskies downed Michigan State 66-62 at Ramstein Air Base, Germany, on Friday. Michigan State is now 0-2 the last two years on military installations, losing to North Carolina on the deck of the aircraft carrier Carl Vinson last year. 10. Non-flattop military update, Part II: We’ve mentioned before our one non-condensation-related pet peeve about the entire hoops-on-ships system — Navy has yet to participate. If you’re going to play basketball on a warship, it stands to reason that the team with players who could one day serve on said warship should get a chance to be part of the festivities. One bright spot for the Mids while all the carrier-themed craziness went on: Navy ended its 22-game losing streak from last year by opening the season with a 75-48 win Friday night over Division III Marymount. Navy’s now 1-1 after Sunday’s overtime loss to Siena.